Charan Tej, fondly called as Cherry is the only son of Padmabhushan Megastar Kala prapurna Doctor Chiranjeevi. Cherry, just completed 26 years and entering into 28th year on 27th of March 2011.Ram Charan Tej, Son of Legendary Actor and Hero Megastar Padmabhushan Dr Chiranjeevi is entered into Tollywood with Chirutha. Ram Charan has got trained on basics in acting from Kishore Namit Kapoor in Mumbai. Charan also got special martial art training at Bangkok. Ram Charan is an expert horse raider and he learned the art of Horse raiding when he was kid. Charan aka cherry's first movie Chirutha hit the silver screen on Sept 22nd 1998 and became a massive hit. It ran for 100 days in 38 centers making it as a biggest hit in 1998 and finest entry into contemporary cinema world. 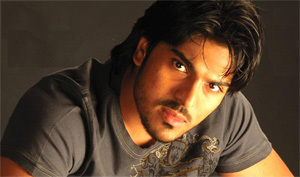 Charan's Second movie is an epic and hot shot director SS Rajamouli directed the Magadheera. It became biggest hit in the annals of South Indian film industry by grossing more than 120 Crore rupees and also ran for 100 days in more than 220 theatres. Recently it is completed 757 days run at Kurnool. After a massive Magadheera Charan tried a different love story film Orange produced by his Uncle Nagababu and directed by Bhasker. Though this movie has not fared well at box office, it remained as one of the best movie in terms of Cherry acting and songs were touted to be the biggest hit in the career of Charan. Now Cherry is working in a film titled as Racha, produced by RB Chowdary and NV prasad of Mega supergood films and directed by Sampath Nandi. This film is geared to release during Jan month of 2012 on the eve of Sankranthi. Ram Charan also signed two more movies one in the direction of VV Vinayak under Universal Media Banner and the other one is EVADU in the direction of Vamsi Paidipalli produced by Dil Raju. Ram Charan is also planning to act in his maiden Hindi venture, which is a remake of yesteryear Block Buster ZANZEER. Another important aspect of Cherry is he bought the POLO team and the team won CM cup and also POLO championships at Hyderabad. Cherry is in love with Upasana Kamineni and she is the grand daughter of Apollo Hospitals chairman Dr C.Prathap Reddy.